Our local Chinese-Malay restaurant, Kenny’s Malay, serves a delicious Duck salad, which we have enjoyed on many occasions. While Kenny’s sauce remains his secret, I have attempted to capture some of its flavours, translated to a dish that can be presented as an entree at a dinner party. Not able to find the microherbs I would have liked to use, I picked the tiniest greens available in my own home garden, slicing the shiso finely. An eclectic mix will give you a myriad of flavours to offset the richness of the duck. Balance the sauce according to the duck you choose. If you’re lucky, your butcher will have used star anise in the cooking of your duck, adding another dimension to the dish. 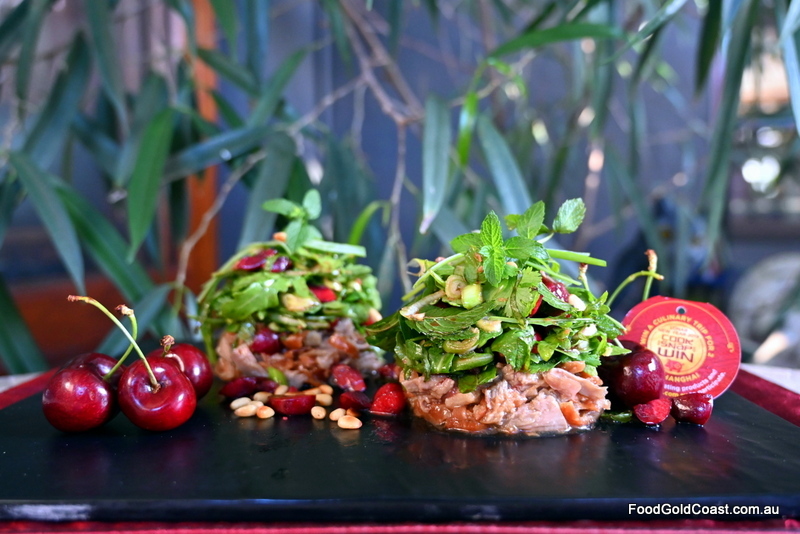 Cherries add freshness and sweetness to the dish, a festive touch for Chinese New Year their flavour and texture complementing the richness of the duck. To make the dressing for the duck, combine honey, rice wine vinegar, plum sauce, soy and hoisin sauces in a jar and shake. Dress the duck while it’s warm, so it will absorb the flavours of the sauce. Remove excess moisture and lightly pat the duck dry with a paper towel. Put aside in a bowl. To make the salad dressing, combine ginger, soy sauce, lime juice, sweet chilli sauce, vegetable and sesame oils in a jar and shake. In a large mixing bowl, combine the microherbs, cherry pieces and half the shallots. Add only enough dressing to wet the leaves. Toss gently to combine. On individual plates, use a large cookie cutter to form rounds of dressed duck, pushing the duck down gently so the stack does not fall apart. Move the cookie cutter up and place the salad on top of the duck, topping with the remainder of the julienned shallots and the pine nuts. Use extra cherries for presentation.